This recipe was passed along from my friend, Jennifer. She made it for the main course at our last stampers gathering. I used it as a savory bite to go along with the tea sandwiches and cake at a little luncheon I had at my house over the weekend. It is very easy to make and has a beautiful presentation. I had a lot of the ingredients left over, so I made another tart this morning and took it to work. I was very popular today. Lay 1 sheet phyllo on paper and brush lightly with a little melted butter. Sprinkle all over with 1 tbsp Parmesan. Repeat layering 5 more times (with phyllo, butter and Parmesan), pressing each layer firmly so it sticks to the sheet below. Lay the last phyllo sheet on top, brush with remaining melted butter and sprinkle with remaining 1 tbsp Parmesan. Scatter onion across top, sprinkle with mozzarella and arrange tomato slices in a single layer. Sprinkle with thyme and basil. 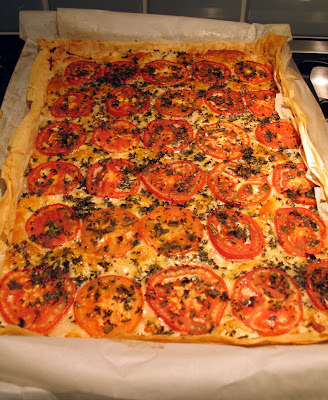 Bake until phyllo is golden brown, 30-35 minutes. Cool 10 minutes, then serve. Makes about 20 3-in squares. 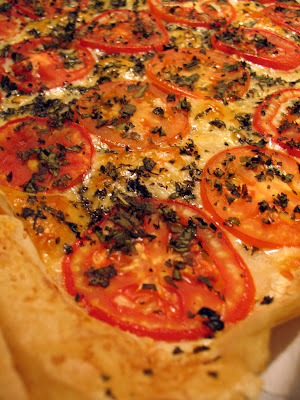 Note: cut tomatoes very thinly so juice evaporates while baking, or dough will be soggy. I pretty much followed this to a T. But I did not add salt. I figured Parmesan is usually salty enough. Oh and the original recipe only called for thyme. I like a little more herb, so I added the basil. The second time I made it I used oregano and basil instead of thyme and basil. I think pretty much any combo of thyme, basil and oregano would be fine. I think dill or tarragon or sage might not be the right flavor with the tomato and cheeses though. And when I cut it, I cut it into smaller pieces. It ended up being one lovely Roma slice in the middle of each piece of tart. I got 30 pieces out of it. The dough, which is very fragile when you are handling it, holds up really well to the tomato. I think the Parmesan acts as a good binder in there. Next time I make this I want to experiment with some different veggies. Maybe toss some red and yellow peppers on there or some mushrooms. The key with the veggies will be to make sure they are sliced thin enough so they don't sog down the dough. And if juicy Romas work, a pepper should be just fine. 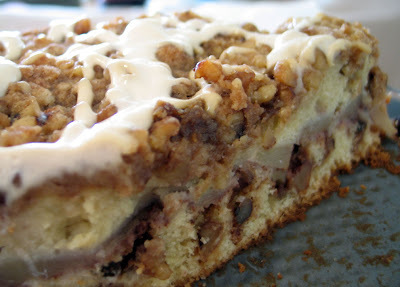 This is one of my go-to cakes. I have made it for teas and baby showers. I have made it for potlucks and sit-down dinner parties. I have made it for stamping brunches and just to take to work and share. I like the pears. They are a bit unexpected. Most people would expect apple, I think. Usually I get whatever pears look best. This time I used Bartletts. Oh, and my recipe is modified from the BH&G one. I like more nuts and more topping. So I upped the amounts of those. My modified version is below. If you don't want it so nutty, click here for the non-modified version. Preheat oven to 350 degrees. Grease a 9-inch springform pan or 9x9x2-inch baking pan. Combine the nuts, brown sugar and cinnamon. For topping, cut the 1/2 cup butter into 2/3 cup flour to make coarse crumbs. Stir in 1 1/2 cups of the nut mixture. Set nut mixture and the topping aside. Toss pears with lemon juice; set aside. In a medium bowl combine the 1 3/4 cups flour, baking powder, soda and salt; set aside. In a large bowl beat 1/2 cup butter with electric mixer 30 seconds. Beat in granulated sugar and vanilla. Add flour mixture and sour cream alternately to batter. Beat on low speed after each addition until combined. Spread two-thirds of the batter batter into the prepared pan. Sprinkle with reserved nut mixture. Gently spread remaining batter over pears. Bake 45 to 50 minutes or until a wooden toothpick inserted in the center comes out clean. Cool in pan on a rack 10 minutes. Remove side of springform pan, if using. Cool at least 1 hour. Now, I like the whipped cream idea just fine. But even better is to take some extra sour cream, mix in a bit of milk to make it more like a sauce and add a bit of brown sugar. It should be a bit sweet, just to take the edge off the sour cream. But not too sweet. The cake is sweet enough. Then I drizzle that over the cake.